Select a pomegranate that is deep red, heavy for its size and is blemish free. The larger and heavier the fruit the more juice it should yield. Feel the skin of the fruit ensuring that it is tight and smooth, it should not wrinkle when rubbed with your fingers. Pomegranates do not ripen once they have been picked. Pomegranates can be stored at room temperature for about a week. Pomegranates can be stored in the refrigerator for up to a month. Pomegranates are easy to freeze you simply put the fruit in a freezer container or freezer bag and store it in the freezer for later use. 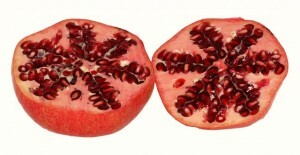 You can also cut open the pomegranate, scoop out the seeds and freeze just the seeds in a freezer container. Ripening a pomegranate on the tree is the best way. They are usually harvested after they are ripe because they have a long shelf life. If you happen to get an under-ripe pomegranate leave it sitting in a cool, dry spot, checking it frequently for ripeness. You can also place it in direct sunlight, where it doesn’t get too much heat, to speed up the process.